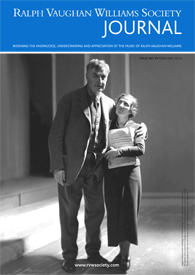 An illustrated journal is published three times a year (February, June and October), for discussion of the life and works of Ralph Vaughan Williams with reviews of new recordings, concerts and articles by experts. Back issues may be purchased (see below). Send your ideas or articles to William Hedley (Journal Editor). Journals 1-40 can now be downloaded free of charge. There is also a downloadable index to Journal Nos 1-44 in PDF format. For Contributors’ index Journals to 1-44. For free downloads (1-40), or to purchase editions 41 onwards, click button below.